This pre owned Apple iMac 21.5 Inch 2.5GHz Quad Core i5 (Mid 2011) is powered by an Intel Quad Core I5-2400S 32-nm Sandy Bridge processor with 6MB shared L3 cache, and Turbo Boost to 3.3GHz. Housed in an all aluminum case with a seamless design where there is no border around the glass. The Mid 2011 models were the first to introduce a FaceTime HD camera and a Thunderbolt port that is backwards compatible with Mini DisplayPort. Thunderbolt can also pass an audio signal and supports compatible peripherals. It includes 4 GB of 1333 MHz DDR3 PC3-10600 memory installed as two 2GB SO-DIMM modules, a 500 GB 7200 RPM SATA hard drive, a slot-loading Dual Layer DVD SuperDrive and an AMD Radeon HD 6750M graphics processor with 512MB of GDDR5 memory. It also features a FaceTime HD camera, a built-in microphone and built-in stereo speakers. The display is a 21.5 Inch Glossy Widescreen LED-backlit LCD with a ratio of 16:9 and a resolution of 1920x1080. Connections include one Firewire 800 port, four USB 2.0 ports, an SDXC card slot, minijacks for Headphone/optical digital audio output and Audio line in/optical digital audio input, and a and a Thunderbolt port that supports data transfer at rates up to 10Gbps and supports an external display at a maximum resolution of 2560x1600. Communications include Built-in AirPort Extreme 802.11n Wi-Fi that is 802.11a/b/g compatible, Bluetooth 2.1 + EDR wireless technology, a built-in IR receiver and 10/100/1000BASE-T Gigabit Ethernet. 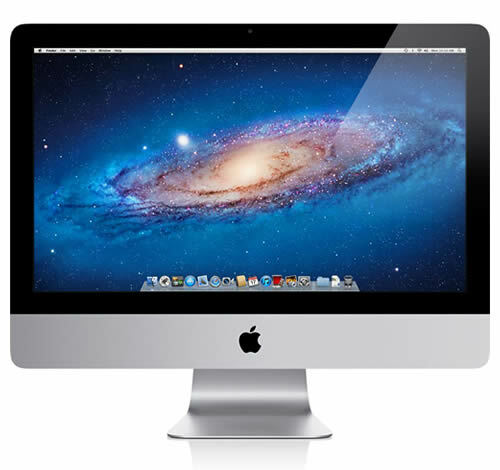 The Mid-2011 iMac was released on May 3rd 2011 and discontinued on October 23rd 2012. The initial release came with Mac OS X 10.6.8 Snow Leopard installed, but shortly after shipped with OS X 10.7 Lion. This used Apple iMac is in full working order and excellent condition. The screen is clear and bright with no imperfections. It comes with your choice of OS X installed, and a power-cord.